Hubby has gone to auctions in the past, and finally convinced me to tag along. He’s gut renovating a few apartments, and needed nearly everything you can imagine – from kitchen cabinets to flooring to tubs – to complete those renovations. When he saw a local Auction house was back in business, he piled me into the car and we took off with a list. Now the first thing you need to know about auctions, is you need to provide ID (driver’s license or passport) and sign in at the office. You will be required to pay for all your purchases in full before taking anything off the lot, there are no refunds (that is a squishy policy, if it plain doesn’t work some auction houses will make good), and there is generally a buyer’s premium plus you pay sale tax. In our case that added over 20% to anything we were purchasing. Check if your auction house accepts credit cards (and what type), or if it is cash only. Still, we got some excellent deals! 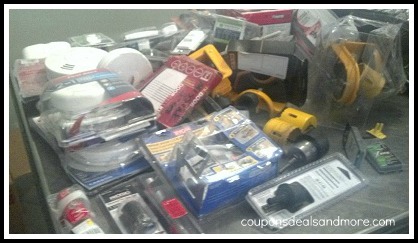 Lots of tools, smoke detectors, flashlights and other miscellaneous items on full shelf purchases. Hubby bought a lot of vinyl flooring. Some of it was stuck together, and when we returned later with it, hubby was given a credit. These medicine chests were $25 + premium, the stickers say $107. Bathroom fixtures, faucets (OMG! 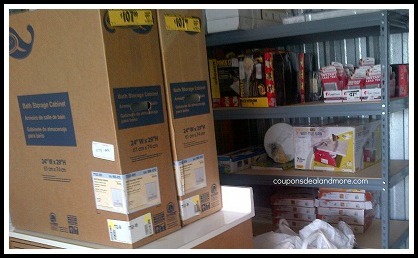 the deals we got on faucets), toilet seats, microwaves, patio furniture, fire pits – you name it, it was there. The volume of product available was astounding. The auction house owner announced immediately that there were a lot of known ebayers there, and their money was as good as anyone else’s. Apparently that was to entice people to pay more? The tools were first up, and I am sure many of those are now up on eBay. The auction continued in the main room for the first hour or so, and then we broke off into groups to follow one of the other two auctioneers, or stay with the original auctioneer. At this point hubby and I went in separate directions. By sheer luck I ended up on the room with the better deals. I bought a 36″ bathroom vanity, vanity top, mirror and matching toilet for $125 total. The bathroom towel bars and accessories I purchased worked out to under $5 each for name brand. Hubby did well, I did great – and it was all a function of the auctioneer and how high the people following him were willing to go. In my group, the answer was not very high at all. Hubby checked out this auction the day before at preview. I would urge people to do so to determine if what you want is ding and dent free, and at what point in the auction your interests will come up. For instance, the auction was supposed to begin at 10 am, didn’t start until 10:30 am, and then they had tools for the next 90 minutes. We could have shown up at noon and stayed later, getting more goods that we had an interest in buying. Also realize that even if you are the first person buying and want to leave, you have to wait for the auction sheets to get to the office. Estimate 20-30 minutes after your last win before you can pay. 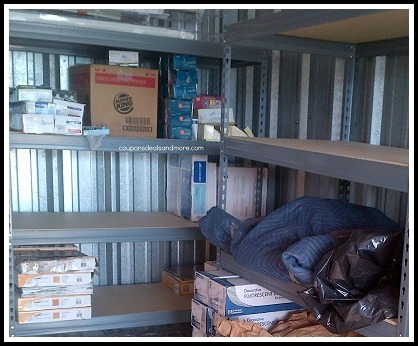 Then you can pick up your stuff (unless other arrangements have been made), load and leave. This can last for hours and hours. When you go to the preview, ask the owner how long s/he thinks the sale will go the next day. 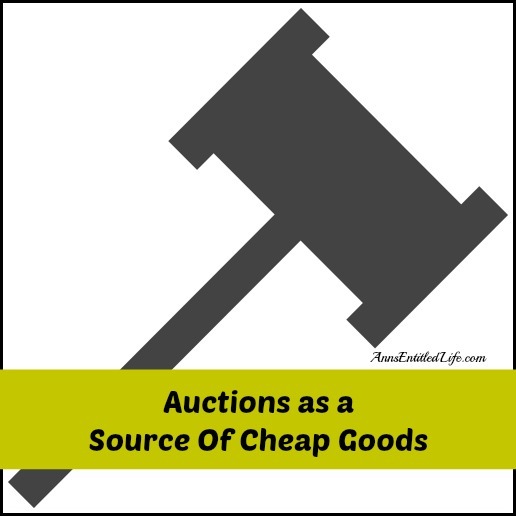 You can estimate 100 items per hour, but if there are 3-4 auctioneers working at the same time, things will run much faster than just one auctioneer. Hubby kept track of every lot he won, and how much he paid for it. Me? Not-so-much. I think tracking is a smart idea, so bring pen, paper and clipboard to write on. We went back for the clearance sale a few weeks later. We envisioned everything tagged (like a yard sale). It didn’t quite work that way at this sale. Basically we gathered a pile and the auction house owner gave us a total. He did give us a nebulous credit for the stuck-together-tile, and our total for a pile of good facets and other miscellaneous goods was about the cost of one of the Moen faucets we purchase would have been retail, so we did get a very good deal. I just feel we got some great deals at the auction itself. 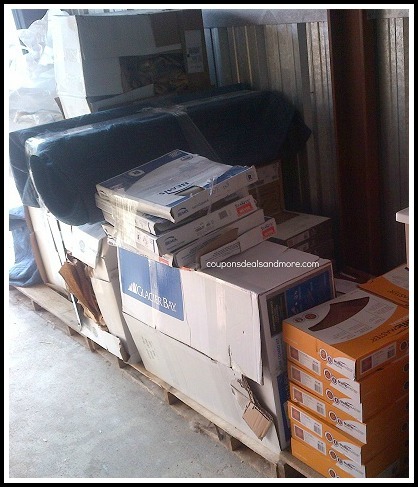 Have you ever been to a goods auction? How did that work out for you? 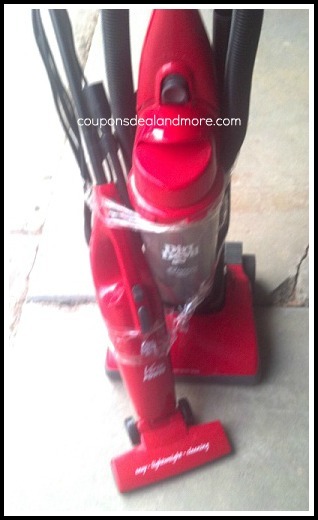 Note: this post originally appeared on my old blog, Coupons, Deals and More. Here are some steps to take if your credit card information is stolen to help protect yourself from unwanted consequences. Last year, my credit card information was stolen twice! The first time my CC company called me about suspicious activity, and the account was immediately closed without any fraudulent activity ever being added to my account. I was then sent new cards, and all was good. Thereafter at least once a month I would get a call from the fraud alert department of my credit card company asking me if this-or-that charge was authorized. This was a giant PITA because Sonny-boy uses my card, and while some items were easily recognizable, other items I had to call back about later. Inevitably, every fraud alert call was a waste of my time … until it wasn’t. While down in Florida in February of 2012, I received another call from my credit card company. Some inner sense must have kicked in, because instead of getting testy with another useless call, I was very pleasant to the rep calling. The fraud agent asked me about some charges that were coming from somewhere in Europe. They were not mine, so all three were denied, and never hit the account. I thought all was well, when two weeks later I received yet another call. This time, over $1600 in charges that were not mine had been placed on my card in just a few days. My credit card company emailed me a fraud statement that I had to sign. When I checked it to return, the dates did not match-up. I was looking at my paper statement, and the fraudulent charges started 2/8/12 not the 2/15/12 listed in the email. After placing another call to my credit card company, we figured out another $2400 in fraudulent charges had been added to this card. Everything from adult websites to clothing stores to auto part retailers, and nearly all charges were from Europe or South America. I saw a great deal of irony in the fact that so many of my valid charges were called upon for verification in the eight months prior, but a week long spat of overseas charges for adult entertainment was completely missed by my credit card company. So what can you do to protect yourself from a cyber thief? • Try and use a credit card online that offers a one-time-use feature. Citibank is the only card I know of that currently has this feature, and is what hubby and I use for online purchases. You can be sure Sonny-boy will be applying when he gets home from spring break. • Some credit cards allow you to receive an email alert for every charge to your card. It is a great way to keep tabs on your account activity. • Many websites now accept paypal as payment. If your credit card is attached to your paypal account, it is another layer of protection against internet thieves. • Know where your credit card is at all times. Sometimes you can’t keep the server that is swiping your card at a restaurant in sight at all times, but do try. • Shred your old statements if you still receive paper ones. Make sure you shred your receipts too once you compare them to your bill for proper account reconciliation. 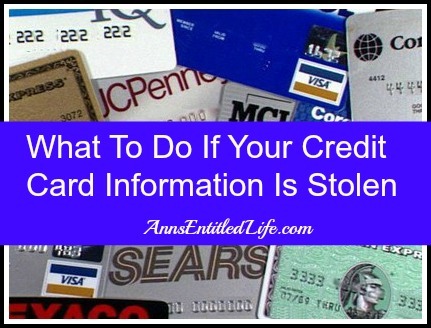 And what do you do if your information is stolen, and fraudulent charges are placed on your card? • If you suspect your card has been compromised, contact the fraud department of your credit card to report the charge. Some credit cards accept verbal confirmation of an unauthorized charge, and will email you a form to email back to confirm you did not make these charges. Other credit card companies may require written verification. It is best to ask when you call the fraud department exactly what they want. • Here are the federal guidelines on stolen credit cards. • Close your credit card and have a new one reissued. Yes, it is a pain, but so is never knowing when the next bad charge will arrive. • And remember, if a website looks iffy, don’t buy there. Better safe than sorry. And sometimes, there is nothing you can do. Very secure websites are compromised. Someone swipes the credit card image and you never saw it. There are all types of thieves out there that would rather use their talents for evil instead of good. Just remember that you are not liable for unauthorized charges, and while inconvenient, waiting for a new credit card is better than the alternatives. Do you have any other thoughts on what to do if your credit card information is stolen? For more Library reading on Ann’s Entitled Life, click here.